"You better watch your step, or it'll be the end of your private little gold rush." 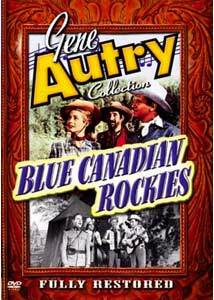 Some of Gene Autry's later Columbia westerns were set in the Old West of the United States, but this entry in the long-running series not only comes back into the modern era, but moves the action into Canada. It also marks the 17th and final teaming of Autry with sidekick Pat Buttram. Gene and "Rawhide" Buttram are sent to Canada at the behest of Cyrus Higbee (Don Beddoe), whose daughter Sandra (Gail Davis) is in control of his timber lands in the Great White North. Her fiancée, Todd Markley (Ross Ford) has convinced her to turn it into a dude ranch for tourists, a change that doesn't sit well with the timber interests in the area, most notably Ed Mitchell (Mauritz Hugo). Strange happenings begin to occur shortly after Gene and Pat arrive, with the horses being released and mysterious shots being fired at Gene. Things come to a head when a Mountie turns up murdered and Gene must find the killer. This picture makes good use of exteriors (though shot at Big Bear Lake, California), with plenty of shots of woodlands that give a decent feeling of Canadian countryside. The script is fairly pedestrian, with the mystery being pretty thin and satisfying only for children. Gunplay is a bit more restricted than usual, since Sandra confiscates Gene and Pat's guns upon arrival at the ranch. Things nonetheless move along pretty quickly, with a running time under an hour, which is pretty short even for a B-Western. Much of the running time is filled with a variety of songs; where other pictures Autry made for Columbia had two or three songs, this one features six tunes, plus a reprise of its title tune. That song is a memorable piece, one of the many hits penned by the prolific Cindy Walker. The songs are not all performed by Autry himself, though. Yodeling singer Carolina Cotton is imported for a couple of novelty tunes in her final film appearance; she had previously been a star with the Spade Cooley western band and had a hit with I Love to Yodel, which she had frequently performed in other pictures. The Cass County Boys contribute a rousing version of the standard The Old Chisholm Trail. Gene is his reliable self, and Buttram is entertaining, with a Harpo Marx mirror gag that he manages to pull off with panache. The two of them have a very entertaining turn with the comic song, Mama Don't Like Music. The supporting cast is pretty uneven,with Gail Davis being a bit of a spitfire this time, but Ford is a virtual cipher. Some of Ed Mitchell's men sport the most atrocious French accents this side of a Monty Python sketch. Image Transfer Review: The original full-frame transfer looks spectacular, with hardly a speckle visible. There's amazing clarity, with good contrast and greyscale and excellent texture and detail. It's beautifully rendered, with the grain visible but not sparkly or problematic. The only issue is the day-for-night photography is pretty sloppy, but that's almost certainly an issue with the original film. Audio Transfer Review: The 2.0 mono audio has a bit of hiss and crackle at times, but it's reasonable and not distracting. The songs sound quite good, with nice range and only a little excess brightness. Dialogue is clear enough. It's not spectacular but a good representation of the audio track. Extras Review: Ay caramba. Wait, wrong border. Anyway, there's the usual large assortment of extras here, beginning with the 1987 Melody Ranch Theater introductions by Autry and Buttram. They don't have much to say about the film, but Gene discusses why he carried one gun instead of two, as well as trick shooting and a history of guns in the West. As a companion piece to this, the disc features a short history of the Gatling gun even though no such gun features in the film. The January 3, 1953 Melody Ranch radio show is included, featuring Buttram and the Cass County Boys again, with a story involving Champion being horse-napped. A hard-sell trailer paints the picture as one full of action rather than singing. Filmographies for Gene, Pat, Gail Davis, and Carolina Cotton are here, as well as bios for Pat and Gail. There's also another (different) clip from her Annie Oakley series, featuring her doing some trick shooting of her own while wearing a frilly gown. A set of production notes is accompanied by materials relating to Gene's Canadian tours of 1951 and 1954, including the 1951 schedule and a letter of appreciation from the Calgary Stampede. I do miss the still and lobby card galleries that were on earlier discs in this set, though. The story is pretty pedestrian, but the songs are particularly good (and numerous) in this late entry in the series. The transfer is sparkling, and the Autry Foundation supplies the usual huge array of goodies.